Mayo’s numbers are very good but would you expect anything less from a team that scores 4-16, plays half the game against 14 and a good chunk of the second half against 13? The fact that they had a stroll in the second half should not colour our view on just how good they were in the first half. They scored 12 times from 15 shots (10 /13 from play) with a Weighting of +4.56 in that first half and generally got their most consistent shooters on the end of moves. Dillon converted his two shots with Varley converting 3 from 5. The flip side of that good first half Mayo performance is the Galway defending. Of the 13 shots that Mayo took from play I counted pressure on only 5 (38%). In the first half of a Championship game you have been targeting for months that is poor. As a contrast Galway took 8 shots from play in that first half with Mayo pressurising 75% of them and actually blocking 3. Now the second half can be completely written off as a contest however even with Mayo asleep at the wheel for the first 10 minutes (they only had one possession in that period to Galway’s 8) Galway couldn’t get a score from play. Again Mayo pressurised any shots they did take (pressure on 5 of the 7) and blocked a further two shots in the second half. Mayo’s second half shooting from play was actually below their first despite the numerical advantage. They hit 77% (10 from 13) in the first half but only 43% (6 from 14) in the second however we can forgive them this as the intensity had gone at that stage. There’s not that much that can be said about Galway’s shooting that a return of 3 points and a Success Rate of 20% doesn’t already convey. 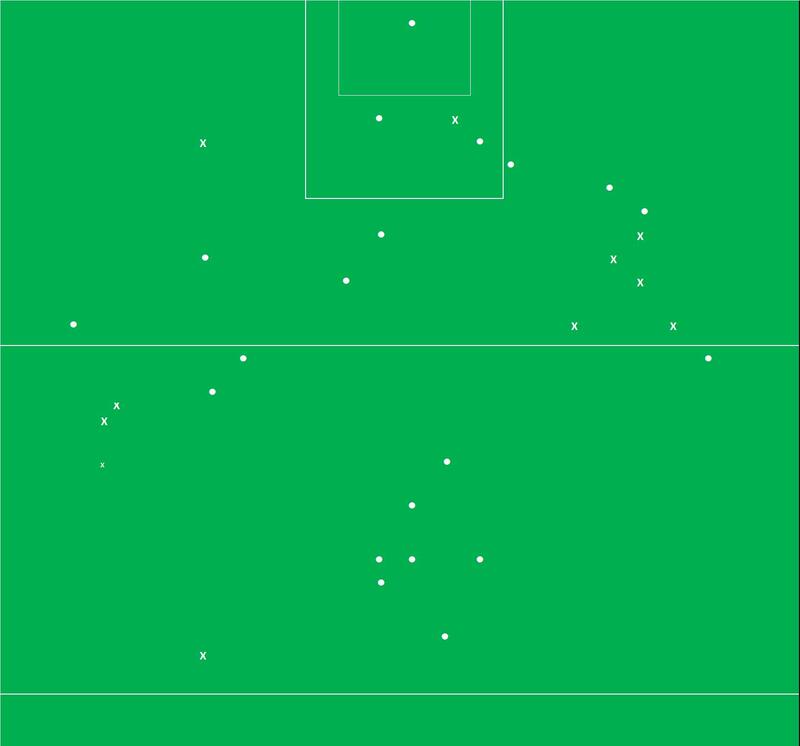 One thing to note from Galway’s shot chart below, in relation to Mayo’s, is how wide the shots are; and when they did get in front of goals Mayo blocked 3 of the 4 shots from Sector 8. One area of the game that Galway did have some positives in was here. All three players had above average days whilst they managed to keep O’Connor to only 4 attempts from frees. Mayo’s shot chart is quite interesting in that they have two distinct clusters. One is in Sector 5 in which they scored 7 from 7 (including 3 O’Connor frees) whilst the other is Sector 7 just inside the 21m line where they only hit 2 from 7 (both Dillon’s points incidentally – he is an exceptionally accurate shooter). There are a couple of things that strike me immediately from the kickout battle. –> Firstly Mayo had a +7 shot differential on kickouts won. That is a very nice position to have where there will be c54 shots in an average game. –> Ultimately though they were devastatingly efficient on Galway’s kickouts. 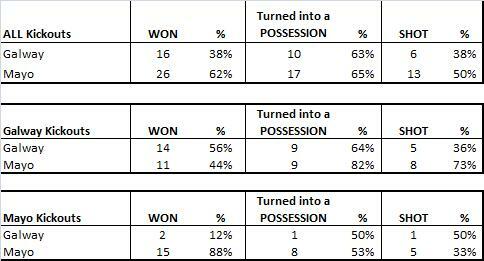 Although they gained possession on 15 of their own kickouts they only converted that to 5 shots. 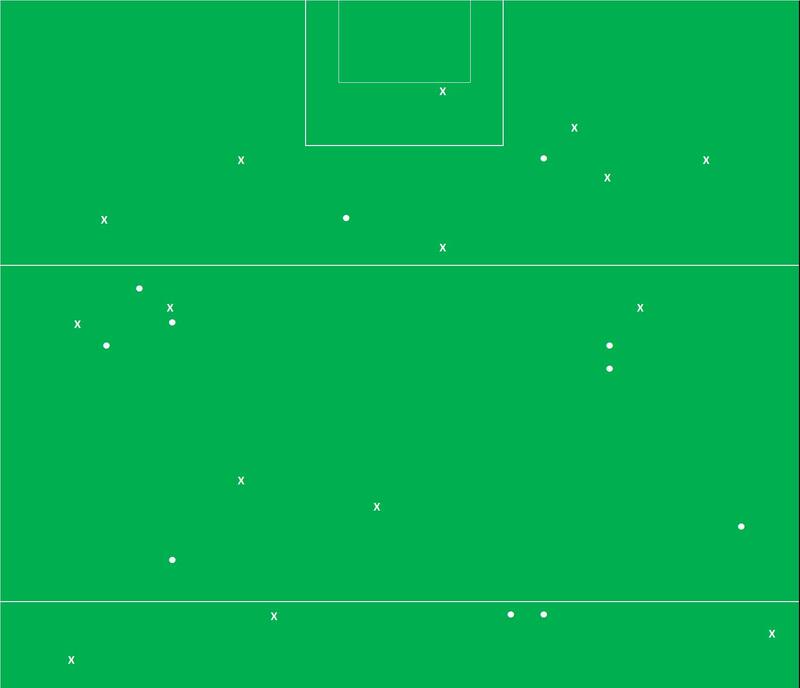 On Galway’s kickouts they converted 11 wins into 8 shots. Player’s contributions can often go unnoticed if they are not getting their name on the scoreboard. One such player on Sunday was Kevin McLoughlin. At the start of the game, when everything was to play for, he got his hands on breaking ball from 4 of Galway’s first 6 kickouts. He emerged with the ball cleanly 3 times and won a free the fourth – those 4 possessions turned into 3 points, settled Mayo down and laid the platform for an excellent start.